You might have logged in to Yandex with a Yandex.Mail for Domain account (with a username like “username@yourdomain.tld”, where “yourdomain.tld” is the name of your domain). To add a domain, log in with a Yandex account by entering your username or logging in via a social network. If you have already added your domain to Yandex.Mail for Domain, log in to Yandex with the same account that this domain is associated with. If you don't remember or don't know which account the domain is linked to, use the form below to send us a message. In the form, choose “I want to restore access to domain management”. If you are connecting a domain to Yandex.Mail for Domain the first time and get this error, the Yandex.Mail for Domain support service can help you access the domain (provided the domain doesn't have any active mailboxes). Use the form below to send us a message. In the form, choose “I am a new domain user connecting the domain for the first time”. If your domain is registered with a registrar and adding the domain gives you a message that the domain is available, confirm adding the domain again. Note that on the page for adding the domain, under "Step 1. Confirm domain ownership" there is another "Connect domain" button. Click it. Your domain will be added. To prevent phishing, domain names that contain "yandex" or another well-known company (such as "google.com" or "yahoo.com") are not allowed to be connected. 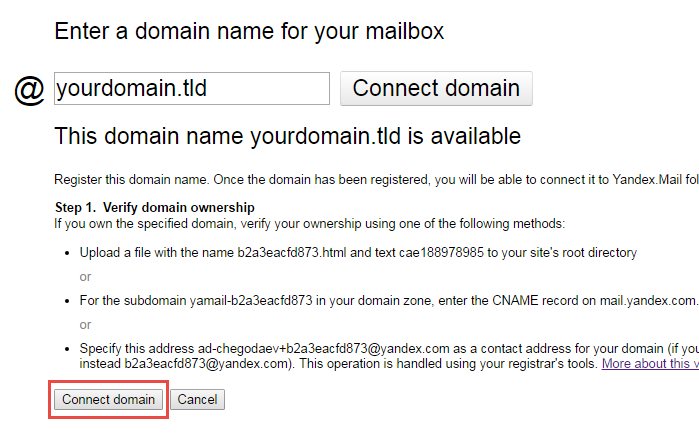 The link on the registrar's site that points to the Yandex.Mail for Domain interface contains a request to connect the domain. An error occurred because your domain is already connected. Use a direct URL in the format “https://domain.yandex.com/domain/yourdomain.tld” , where “yourdomain.tld” is your domain name. Log in to the administrator's account first. Notify the domain registrar's support service of this error. Most likely, your domain's registration hasn't expired yet. You can check this using the http://www.whois.com service. If you need to connect someone else's domain to Yandex.Mail for Domain, register a new account on Yandex and sign up the new domain while logged in under this account. To later transfer domain management to the new owner, you just need to give them the username and password for the corresponding Yandex account. Connecting a large number of domains to a single account can be risky: if you lose access to the account, you lose access to all the connected domains at once.